You can now earn up to £50 cashback on us. All you have to do is purchase their chosen qualifying GROHE SmartControl Shower now and complete the cashback claim form on Grohe’s website. This is a promotion from Grohe UK and UK Bathrooms has no responsibility or liability for this promotion. WELCOME TO THE JOY OF SHOWERING! 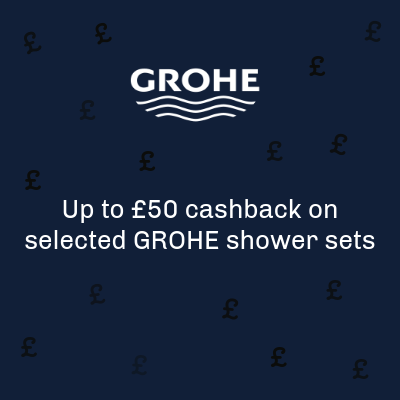 Start from February there is up to £50 cashback on selected Grohe shower sets. Utilise all the physical elements of water to create your unique shower experience. Turn your bathroom into an indulgent space for physical, emotional and spiritual well-being. Grohe shower systems combine several industry-leading technologies, which ensure outstanding performance and an unbeatable shower every time. Below are the selected Grohe shower sets which qualify for the cashback promotion. 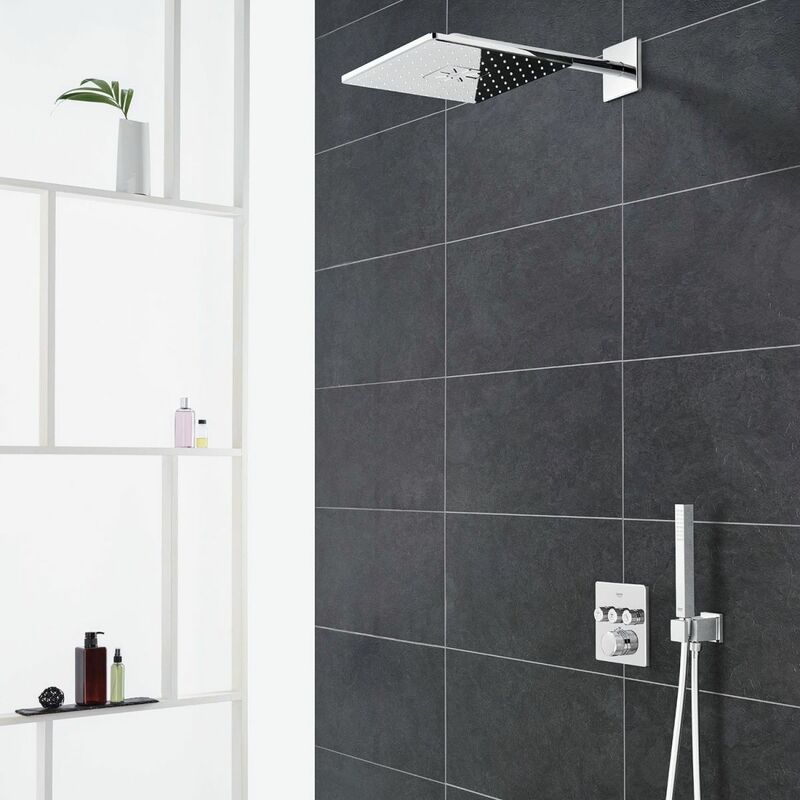 Running through a high-pressure water supply above 1.0 bar, it will provide great performance from both the overhead shower head and the smaller handset. Grohe Grohtherm SmartControl Perfect Shower System gives you full control of your shower experience. 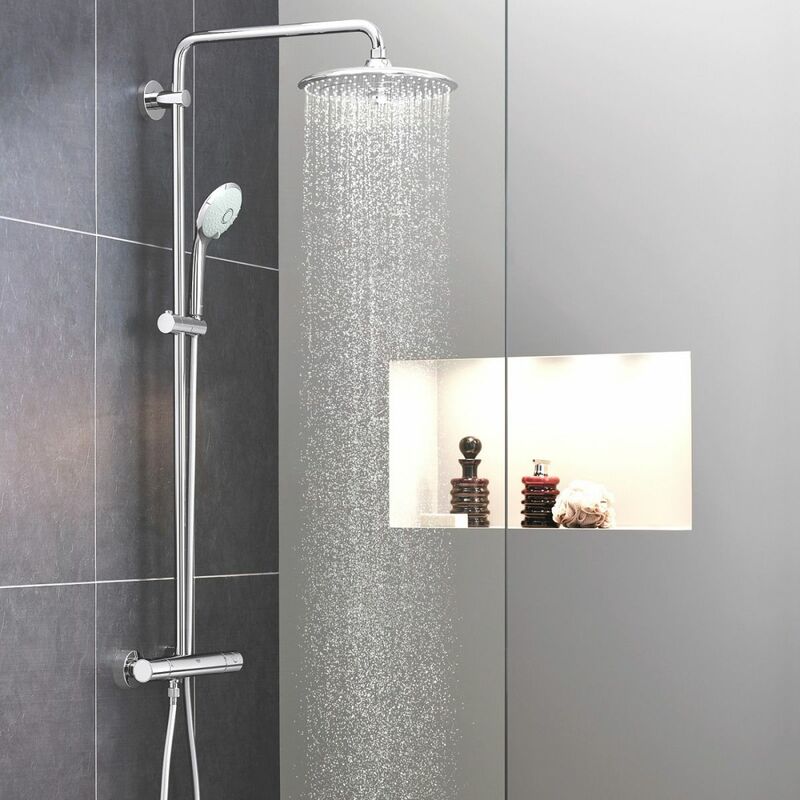 Including a Smartcontrol valve with Rapido installation box, an overhead SmartActive head with shower arm and installation set plus the supremely versatile Euphoria Cosmopolitan Stick Hand Shower, hose and wall outlet, it is a self-contained dream of perfection, design and technology. 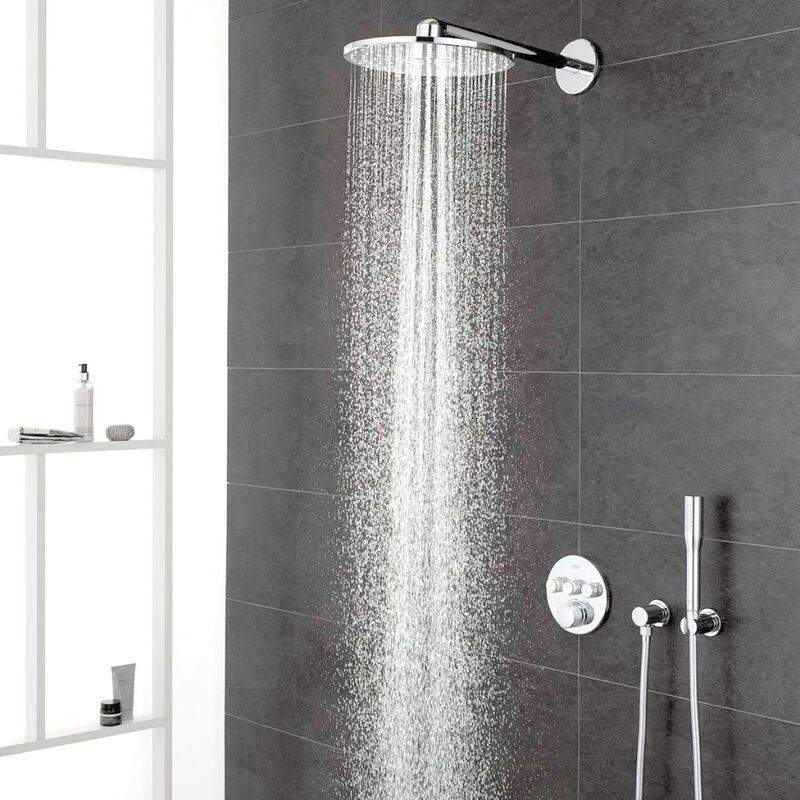 The premium shower head is a large 310mm square and includes a central spray control button providing options for the PureRain or ActiveRain settings. These spray modes delivers a contrasting style of spray from waterfall or jet. Flexibility is a vital part of the Euphoria design with the massage hand shower having three spray settings itself to mirror the Smartcontrol overhead shower. 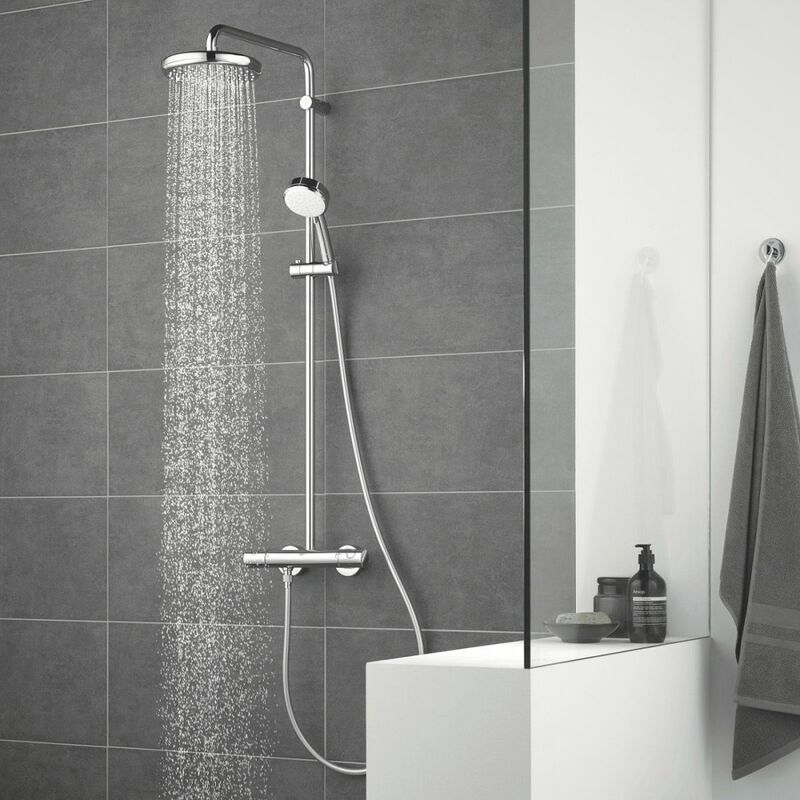 Complying with the top standards and thermostatic performance guidelines, this is one of the best and most inclusive shower sets on the market. How to qualify the cashback programme? Purchase GROHE shower system from UK Bathrooms and complete the cashback claim form below. Offer on purchases made from 1st February 2018 until the 31st May 2018. All claims must be made by the 30th June 2018 to the manufacture Grohe. Proof of purchase is required. Terms and conditions apply. This Promotion is offered by the manufacturer Grohe. As we have mentioned previously, there is a trend of more people opting for showers over a bath, when it comes to bathroom design. The number of baths sold have dropped whilst showers have increased. Manufacturers have also noticed this trend and responded by offering a huge range of showers, shower enclosures and wet room options to help you create your perfect bathroom. Standalone shower enclosures are a fantastic choice for any bathroom, allowing you space and movement when you shower. They are considered safer than a shower over a bath, and easy to use for people with mobility issues. Plus many shower enclosures come in a range of designs so they can fit any space and work with traditional or contemporary designs. Simpsons Shower trays, for standalone shower enclosures can be made from cast stone or heavyweight acrylic in a number of different colours such as the Simpsons Grey Slate Textured Shower Tray. These trays have a lead time of 3-5 days which mean you don’t have to wait to fit your shower enclosure. They have a water tight seal with adequate drainage, so no water escapes from the enclosure. Choose from compact designs with just a small shower tray or a luxurious design which also has more room for one or more people and also a drying tray. To fit your shower enclosure choose from, different sizes and configurations. All enclosures are water tight and come with a choice of openings including; sliding doors, pivot doors and bi-fold doors. Designs can be created to fit the space you have. It looks like the UK is heading towards the trend of European style wet rooms. Developments and newer technology have meant that it is now much easier and cheaper to transform your bathroom into a wet room. Kudos Showers described as the “Art of Showering” have a fantastic high quality range which you can use to build a wet room. The rooms are waterproofed (tanked) and fitted with a walk in shower, they can be fitted with shower screens but it is not necessary. The floor is gently sloped so water can drain away into one spot, away from the toilet or sink, so these areas remain dry. By using non-porous bathroom tiles like ceramic or porcelain, it stops mould and damp being created in the tiles and grout. If you opt for porous tiles you will have to have them treated. There are a number of benefits to Turing your bathroom into a wet room. It will open up your bathroom and create a more usable space. This works especially well in smaller bathrooms, as it stops the room feeling claustrophobic. It is also helpful for those with mobility issues. The luxurious lifestyle of a wet room, works well with contemporary designs and there are a number of touches which add to that; such as underfloor heating and high quality finishes for the tiles. As well as aesthetics, wet rooms can be beneficial to your home, correctly fitted you will be protected from moisture and damp which can damage walls. Finishes are also long lasting which means you don’t have to worry about replacing your wet room floor. More of us are becoming conscious of the environment that we live in and there is an effort by many to change the way in which we buy products, to ensure that we are as “green” as we can be. At UK Bathrooms we have always tried to source eco products and the latest eco friendly freestanding baths are just some of the products that we offer. Our latest from Bradford Based Clearwater is another eco friendly and positively green idea, and their baths will give a new and entirely different level of comfort and sustainability. For one thing the bath its self will retain the heat in the water for a period of 30 minutes longer than a standard bath, the baths themselves are constructed in an entirely new way as well. They are very tough and resilient withstanding a remarkable 2.3 tonnes pressure on the base which is manufactured from encapsulated recycled composite for the baseboard which is stronger than the chipboard used on normal acrylic baths and it has the advantage of being green as well. The ClearGreen Freefuerte Oval Freestanding Bath is one of the collection from Clearwater and is available in two variants, covered freestanding or skinless. This beautiful eco friendly bath with be an eye catching addition to any bathroom which has a capacity of 132 litres. There is something about seeing a freestanding bath that oozes elegance and takes one back to a time when the pace of life was more relaxed, when we did not have to do everything at running speed as though our lives depended on it. The elegant lines that some of the retro styling baths display is naturally easy on the eye and is in stark contrast to the sharp angles of some later periods. The Clearwater Battello Bath displays elegance as it sits upon the chromium classic feet but what really catches the eye is the beautiful elliptical curve seen on the lip which in turn dips gently down at the centre. This in itself offers an easy and convenient way to access the bath and adds to the classic look of the bath. The Clearwater Battello is manufactured from natural stone and is supplied with two tap holes that will accommodate a variety of taps and to complete the retro appearance a Victorian style “telephone2 style hand shower mixer would complete stunning appearance. The taps and wastes are not included in the special low price and the bath carries a 10 year manufacturer’s guarantee. In common with other products in the Grohe range the Aria is a well balanced and an elegant bath shower mixer, neatly wall mounted and finished in high chrome. But, above all the Aria is a technically advanced unit which is designed to give years of trouble free service and uses ceramic discs to eliminate those annoying drips and the need to replace washers. The Grohe Aria Bath Shower Mixer Valve is designed to give balanced hot and cold water supply and setting the right temperature for your bath or shower is child’s play. Fitted with a mousser aerator with an integrated non return valve, the unit is being offered at £210.99 which includes VAT and is a discounted over the recommended price of £324.70; the recommended working pressure is 1.0 bar.